Li, Shengnan Pan, Qianqian Frey, Bruce B. and Rodriguez-Blazquez, Carmen 2018. Development of a Chinese and American scale for measuring spirituality. Cogent Psychology, Vol. 5, Issue. 1, p. 1. 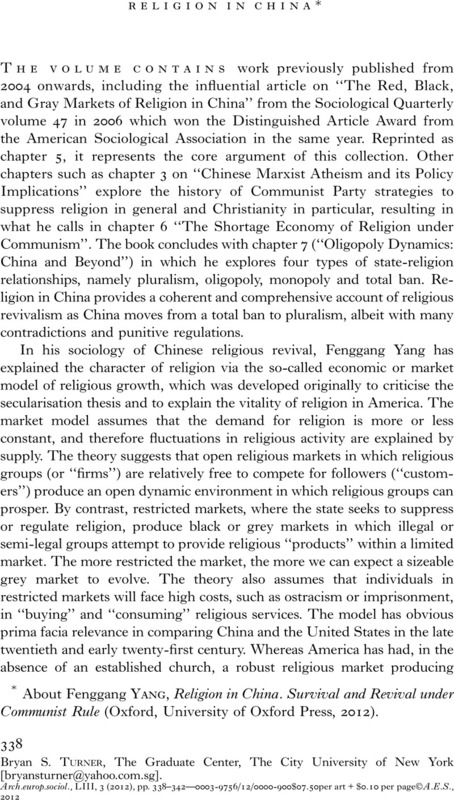 Religion in China - About Fenggang Yang, Religion in China. Survival and Revival under Communist Rule (Oxford, University of Oxford Press, 2012). aThe Graduate Center, The City University of New York [bryansturner@yahoo.com.sg].